From our humble beginnings as a small lead job shop back in 1978, to a complete solution for turn-key manufacturing, we’ve shown the strength of a leadership position for 40 years. Whether you need a component part or a turn-key solution, we strive to consistently and efficiently provide you with the highest quality products from a clean, well-organized environment. 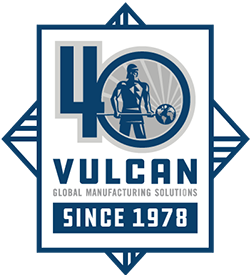 Vulcan has always focused on innovative solutions for our customers, offering multiple manufacturing capabilities to ensure we have the best options for your needs. We’re the world’s leading supplier of lead and lead alloy products. State-of-the-art equipment ensures the highest quality. Custom fabrication of sheet metal and tubular frame products. Customers benefit from our concurrent design expertise by working with us at the very beginning of new product concept development.